Girls of Paper and Fire is a blazing debut. (All the fiery puns from now on). The world building is vivid, the themes are moving, and the characters light a spark within you that burns until long after you finish these gorgeous pages. Girls of Paper and Fire is lush. I cannot decide what I loved best so I feel as if I need to talk about all of it. Because yes – I think it’s that superb. The world building is detailed and descriptive. That’s my biggest pet peeve in fantasy, but Ngan paints us this stunning picture complete with a map. I felt immersed in the world, almost as if I could feel the clothes on my skin, the water on my face. The characters are phenomenal. Not only is this a story about a f/f relationship, it is also a story about friendship, about solidarity in the loneliest of places. There are notes of sadness, of trauma, of grief, but there’s also a blazing desire for freedom – an essential quest – that ignites hope within us. So now onto the deeper review. This #ownvoices narrative is steeped in the desire for diverse voices – a passion for diversity on the pages. And it shows. Ngan states that this book is about female oppression, but also empowerment and I cannot think of a better way that is exemplified than the title. Instead of just focusing on the paper girls designation that Lei has, it opens up the space for hope by emphasizing fire. And Lei is just that. She struggles with trauma, with oppression, but has this quiet bravery, a strength simmering below. Lei is resilient and even, in some ways, ambitious. And Lei is relatable in the sense that she can be a bit self-absorbed sometimes – like we all are. She needs the people around her to give her some perspective and to open her eyes to what’s happening around her. There is a real injustice and cruelty in the system around her. Lei encounters fierce hatred and discrimination because of her status as a paper caste – the lowest of the castes. And the plot is ripe with secrets, challenges, and the fight for survival. This intense action driven plot comes together with a fantastical world and endearing characters to make a stunning book. Each of the characters were so intriguing, even if you only saw them for a brief second. Their actions, their personality made you want to know more. What I also loved, besides the f/f romance elements, was the way that the paper girls learn more about each other. I’d read just a whole book about them. They deal with their trauma in different ways and Ngan doesn’t shy away from this. There are the ways in which we cope, deny our feelings, and try to find meaning, some shred of happiness in a world beyond our control. Girls of Paper and Fire is about discovering your strength and fighting for meaning against a system that deems you inferior. The end sets the groundwork for a truly promising sequel that is sure to be as stunning as this one. I want to learn more about this world, really delve into the other castes. Do yourself a favor and check out Girls of Paper and Fire on Goodreads. What’s the most hyped book that you haven’t read yet? the most hyped book I haven’t read yet is actually a trilogy! the Daughters of smoke and bone trilogy! I want to read it but with how long my current tbr is I probably won’t be able to read it for a while 🙁 merp. 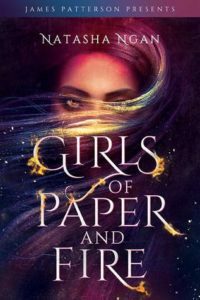 I loved your review of Girls of Paper and Fire and I can’t wait to read it myself! Ugh it’s kind of crushing to think about…well make sure to take some time for yourself too!! !